In this chart we see the distintion between the craft and the science model. In the craft model part I wrote the knowledge you can learn by imitation and in the science model part I wrote the knowledge you actually have to study to understand it. There are different methods to become a teacher. One is the craft model or imitation model where you learn by imitating others. Another model is the science method. 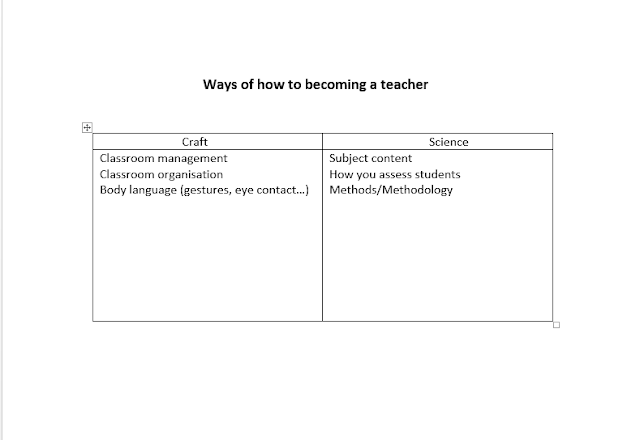 In this model you have to learn a metodology, talk with other other teachers about that specific methodology and finally, create a lesson plan together.